At today’s Marketing Derby Annual Business Event (#ABE2018) it was announced that we have been awarded this year’s Rising Star award! It’s incredible to be recognised as this year’s Rising Star. 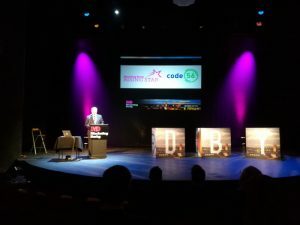 Being a Bondholder allows us an opportunity to raise the profile of Code 56 in the Derby business community. Being awarded the Rising Star allows us to do this in an accelerated fashion that I’m truly grateful for. To make the very most of being the Rising Star, my intention is to attend as many events as possible and get an event of our own (or co-hosted) on the waiting list. I’d love to promise to be at every event, but I know that is not a realistic promise to make. I see this as an excellent way to get to know fellow Bondholders and develop strategic partnerships where we can help each other meet and exceed our goals. As well as the opportunities that being a Bondholder will present for us, I’m keen for us to use our “How can we help” attitude with wider Marketing Derby activities where we can help promote Derby.